Pantry moths also known as Indian meal moths are brought into your home by food you have purchased from the grocery store. Pantry moths have three life cycles, Firstly the female will lay her eggs in a source of food such as rice, grains, and other cereals. Pantry moth eggs will hatch into larvae approximately four to eight days after the egg has been released from the female pantry moth. Pantry Moth Larvae are approximately five mm long with a creamish colour & looks very similar to Maggots. Pantry moth larvae will usually mature around three weeks after hatching. Adult pantry moths are around 10 mm in length with brown/grey coloured wings and can be mistaken for other moths if you don’t realise you have an issue. Webs: Indian meal moths will make webs in the food items they have infested. Flying around day or night: pantry moths are usually nocturnal and are attracted to lights. Eggs: Indian meal moth lays its eggs in such products as grains, flour, cereal, seeds, dried food, and also pet food. Maggots: you will see maggots in the food packaging/containers and can also see maggots in and around your pantry. Here in Sydney the Indian meal Moth is considered the most troublesome out of the grain-infesting moths and can be quite tricky to get rid of if you don’t know what to do when you realise you have the pantry moth. 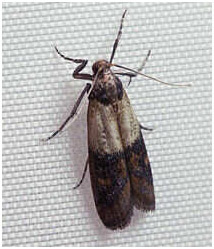 Indian meal moths will cause damage by the larvae spinning silken threads as they feed and crawl through your food. Pantry moths will spin food particles together with their webs. Prevention & treatment for Indian meal moths. Inspect all suspected food before storing or placing into your cupboards. If the source of the infestation is not in the kitchen or pantry, then you need to check other rooms for various grains, seeds, dried fruit, etc that may cause an infestation. Store all food in insect-proof containers with tight-fitting lids. Transfer products that are packaged in paper, cardboard, or plastic bags into tight sealing containers such as Tupperware. 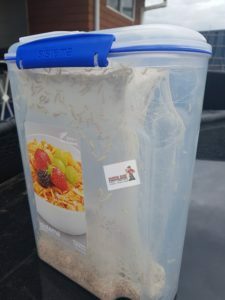 You really shouldn’t keep food storage products for long periods of time as if you don’t notice you have pantry months this can cause other food items to also spoil. Immediately sweep/vacuum/mop all spilled food materials. Clean shelves with eucalyptus and hot water, allow to dry. Remove and destroy all webs by vacuuming or wiping with eucalyptus spray. Pay close attention to cracks and crevices as this is where they can store their eggs. Remove all eggs and feeding larvae by carefully discarding infested food items outside in the council bin. Inspect every box, bag, or packaging of food, even if it is sealed, it can still have Indian meal moths in there, open it check for unlikely spots like dried herbs, pasta, dog and cat biscuits, etc. 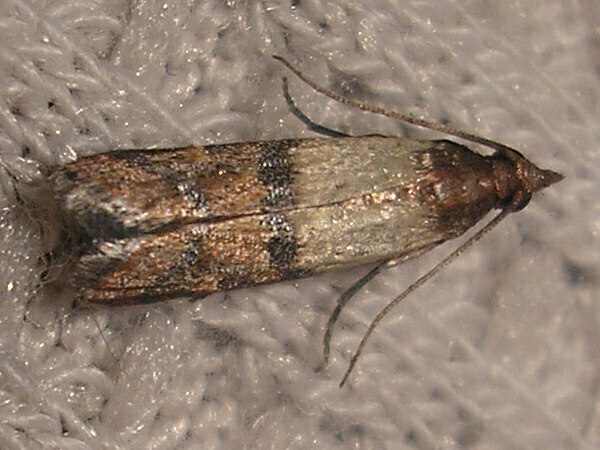 •Remove all shelving liners in your cupboards and pantry’s as this is the perfect breeding grounds for Indian meal moths. •Wash down all walls, floors and especially the inside of the door hinges and door jams with eucalyptus oil. • When you are certain that you have thoroughly removed the sources of pantry moths empty your vacuum bag and wash down your garbage bin as if one tiny egg is hidden here then you can get an infestation very quickly again. • Once you finish cleaning you can put down insect glue boards which are boards that have a pheromone in it to attract the male pantry moth and will trap it therefore will help stop the breading process. 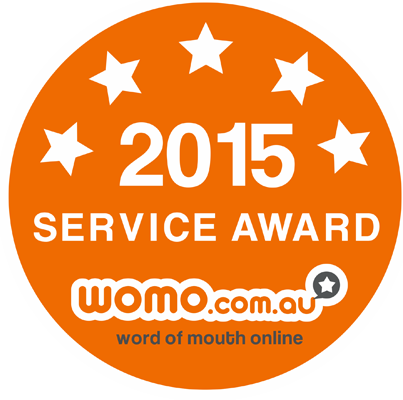 If you are unable to get a hold of pantry moths call us today and we will get the infestation under control. So you have discovered that you have Pantry Moths in your kitchen, now what can you do to eradicate them. Here is some instructions on how to eradicate them on your own without having to call a pest control company to come out and provide you with a treatment. Any reputable pest control company will advise you on how you can get rid of pantry moths on your own before recommending a pest treatment which can cost you hundreds of dollars. Redline Pest Control will always advise you of alternative treatment before commencing on a pest treatment as some pest are easy to eradicate yourself. Once the Pantry moth has been located it’s time to clean up the mess that they have left behind. You will need to inspect every inch of your pantry and food packaging whether it is open or not as they will eat through the packaging. If you are certain you have located the only food items infested, just put them in a garbage bag, seal it and throw it outside in your council bin. Also look to your ceiling as sometimes you can find the larvae crawling along your ceiling. Larvae look like creamy colour maggots. If you do find the larvae also wash your ceiling with soapy water or eucalyptus oil. 2. Check unlikely spots like dried herbs, pasta, dog and cat biscuits, etc. 3. Inspect every can or jar, lids and rims of cans are big enough for pantry moth’s pupa to spin a web. If you find webbing, wash it with water. 4. Remove all shelving liners as they could be breeding underneath the liners. 6. Wash down all walls, floors and especially the inside of the door hinges and door jams; you can use sugar soapy water or eucalyptus oil. When you are certain that you have thoroughly removed the sources of pantry moths empty your vacuum bag and wash down your garbage bin. Once you finish cleaning you can put down insect glue boards which are boards that have a pheromone in it to attract the male pantry moth and will trap it therefore will help stop the breading process. If you still are unable to eradicate the pantry moth call Redline Pest Control on 0426 002 007 for a free no obligation quote.